Discussion in 'Hardware Mods' started by kadorna2, Apr 15, 2019. Successfully delidded my slim 2001A, effectively ending the thermal problems. Used a n° 2 painter's knife to do the job. The thermal paste under the IHS was so dry and hard i had to scrape it off in order to remove it. Applied some arctic silver 5 both under and on top of the IHS and the temps dropped between 25 and 30c. DeViL303, lmn7, sandungas and 4 others like this. your first try ever?i'm thinking of doing it on my cechc that begins to have problem with cell temps,never done it myself (i had a guy locally that was good and did all my consoles and PC's but he moved) and maybe experiment with some liquid metal but not having heatgun (and not even a hairdryer) is what's keeps me from trying (and not wanting to risk my precious cechc ). i've watched countless tuts,read all about it,even tried to make that damn tool myself but never had the guts to do it,so i'm wondering it's really hard to do it right on the first try? Good one! On my first try I succeeded in CPU but when prying off GPU IHS, the screwdriver dented the GPU substrate and resulted in instant YLOD. Therefore, NEVER use brute force to pry off GPU IHS, always heat it up and use razor blade to cut the glue on 4 corners. Successfully did CPU and GPU delid to 4 other fat consoles and everything worked. The tool I used to delid CPU is a fingernail file with its tip bent and sanded down. Sometimes it will scratch CPU substrate but will not do any actual damage. Well, actually I did put a expired credit card on the substrate, exactly as what is shown on youtube. However, the glue might be too strong or the temperature might be too low, so when I applied force the screwdriver penetrated the credit card and dented the substrate. The IHS did pop right off though. Anyway, I learned to use razor blade to cut the glue on NSC mod's youtube channel, it seems to be a safer way for me. I'm clearly not an expert in this field but aren't razors dangerous to both the substrate and the die? Yes, it does, that's why you never use a razor blade to delid the CPU. For GPU, the structure is different. 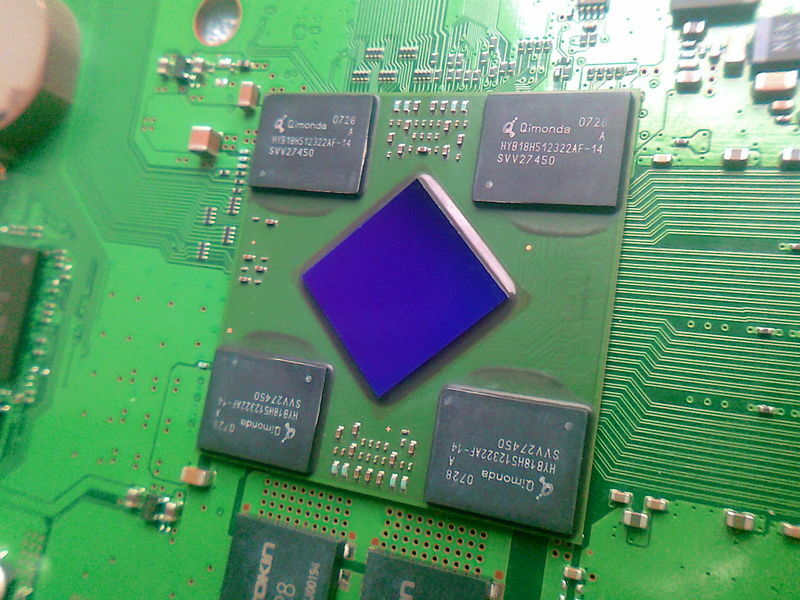 Glue is used on memory chips (black rectangles on 4 corners) to secure the IHS. Since memory dies are encapsulated in epoxy, it's virtually impossible to damage the chip by scratching its surface. Just be careful with other small passive components such as capacitors when you are using the razor blade, since you don't want to knock them off or cut the motherboard.